Thank you for taking an interest in our school. I am extremely proud and consider it to be a privilege to be the Headteacher of Great Marlow. Over the last few years the school has gone from strength to strength and now enjoys an enviable reputation as an excellent school that is hugely over-subscribed. We have consistently demonstrated that GMS creates opportunities for every child, supports them to release their potential and enables them to achieve excellence. Great Marlow became an Academy on 1 August 2011 and is a mixed school with over 1,300 students, aged 11-19, of whom over 200 are in the Sixth Form. 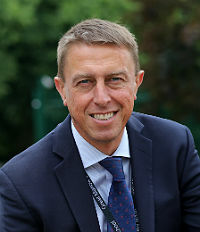 In recent the years, the demand for places at the school has considerably outstripped the number of spaces available, so the governors, in 2015, agreed to expand the intake to 230 students in Year 7 to allow more parents, carers and students to access their first choice school. To accommodate the increased number of students, the local authority funded an extensive building programme, which was concluded in February 2018. This programme included new performing arts accommodation and a stunning two storey block adjacent to the hall containing 7 new classrooms and the new school entrance. At the same time, very importantly we have doubled the size of the dining facilities, developed a number of excellent outdoor seating areas and significantly improved the security of the site. All this enriches and enhances the learning environment with modern facilities designed specifically to accommodate our flourishing school. The latest development of the school’s facilities follows quickly after the opening of our ‘state of the art’ sports centre named after former student Sir Steve Redgrave and the Sixth Form Centre, with study facilities that would grace a university. These facilities, opened in 2013 and 2014 respectively, continue to inspire students to strive to achieve the very best possible. Our curriculum has been carefully designed with significant flexibility to make sure it meets the needs of all our students. It provides a very broad and balanced curriculum at Key Stage 3, an excellent range of options at GCSE and, in the Sixth Form, a wide range of A-level qualifications. GMS also offers a number of vocational courses in Key Stage 4 and in the Sixth Form. We are proud of the continuing academic success achieved across the three key stages. The examination results at both GCSE and A-level, including the vocational qualifications, are excellent due to the inspirational teaching; outstanding relationships between staff and students; and the aspirational climate of the school. All students experience the highest level of care and guidance to support their personal and academic development, and this reflects the commitment and dedication of the staff: it is the essential ingredient that ensures every student makes exceptional progress. Great Marlow continues to be an integral part of the local community. The governance of the school is a key strength and has played an integral role in shaping the vision, values and ethos of this establishment. The governors are a dedicated, highly qualified, professional team of people who work extremely effectively with the leadership team to ensure continuing success. Students thoroughly enjoy school and are clearly proud to attend GMS. Visitors always comment on the fantastic atmosphere that pervades the school, the purpose and commitment, but also the smiles and obvious enjoyment of everyone involved. We are extremely proud of our school and encourage parents and carers to browse this website for further information.